Sleeps 3-4 Adults or small family groups. First child stays free. Kitchen/Diner. Small but fully equipped with electric cooker, fridge, kettle, microwave and washing machine. Dining table and 4 chairs. No garden, but there is a small shared courtyard to the rear of the property with a seating / smoking area and storage space for bicycles. There is ample free parking outside or very near the house. From £49 per night. 15% discount for week-long stays. Includes electricity, gas, free wi-fi and daily servicing. The apartment has full gas central heating and is available all year round. The house is popular with guests attending weddings at Duns Castle, Manderston House and Wedderburn Castle. Convenient for all local amenities and tourist attractions. Nearby, and open to visitors, is Manderston, featured on television as “the swan-song of Edwardian architecture”. It is the finest country house of it’s era in Scotland and features a silver staircase and superb, extensive gardens. Duns hosts the Jim Clark memorial museum dedicated to the famous Formula 1 world champion who lived locally. The town is also the birthplace of the renowned 13th Century philosopher John Duns Scotus, who was beatified by Pope John Paul 11 in 1993. Just a short stroll away is Duns Castle and Nature Reserve, offering great walks and a wealth of bird and animal life. If you are very lucky you might see an otter or even an osprey here! Duns offers a good selection of local shops, pubs, cafes and restaurants. 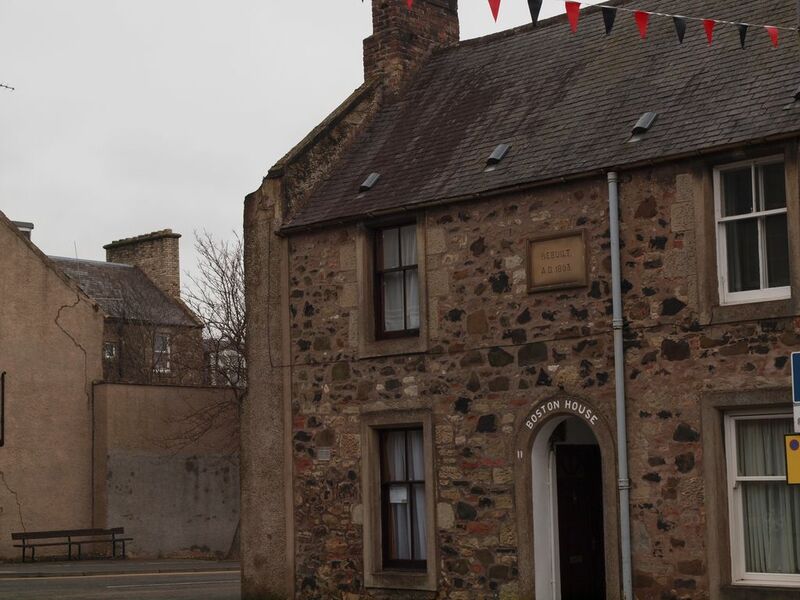 Further afield, but all within a 15 miles radius, is the historic walled town of Berwick upon Tweed, delightful Kelso and the old fishing port of Eyemouth with a great beach and the best fish and chips in the Scottish Borders! Coldstream, the home of the Guards Regiment, is situated on the banks of the beautiful River Tweed 12 miles away. Edinburgh, the grand old capital of Scotland is just a 45-minute drive from Duns. The whole area offers great opportunities for walking, cycling, fishing, birdwatching, photography and history enthusiasts. Dating from the 2nd Century, Edin’s Hall Broch is the finest example in the Scottish Lowlands. It is situated near Abbey St Bathans in an evocative and beautiful landscape. The grand country houses of Manderston, The Hirsel, Mellerstain, Paxton, Abbotsford and Floors Castle are all within easy reach and are open to the public (please check times)! Berwick upon Tweed is one of the finest walled towns in Europe. It has many listed buildings, including the first purpose-built Barracks in the UK, now the home of the Kings Own Scottish Borders Regimental Museum and, also part of the William Burrell collection bequeathed to the town by the famous philanthropist who lived a few miles away at Hutton Castle. Ancient churches can be found at Fogo, Edrom, Chirnside, Norham, Ladykirk, Coldingham and Dunglass, all within 20 miles of Duns. The glorious Border Abbeys of Melrose, Jedburgh, Dryburgh and Kelso can be reached in around 30 minutes, along with historic Lindisfarne Priory, situated on the unique and wonderful “Holy Island” near Berwick. Trout and Salmon fishing is available by permit on the Whiteadder, Blackadder and the world-famous River Tweed. Sea fishing trips can be booked from Eyemouth, Berwick or St Abbs.